There comes a time in every cabrio owner's life when the inevitable happens. The rear window cracks or splits, or becomes nearly opaque. 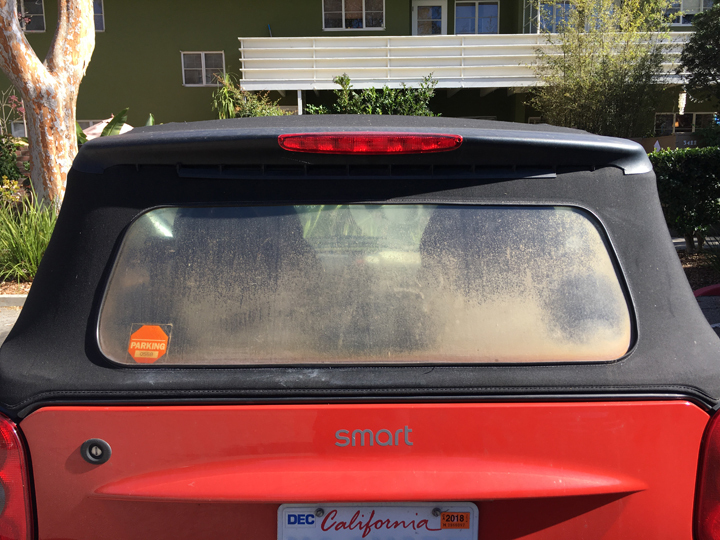 There are several options for fixing the situation, but unless you want to spend big bucks letting some stranger undress your smart, you'll need to get your hands quite dirty. 1. Open the trunk and unlatch bottom roof catches. 2. Unhook the the clip in the centre of the lower window frame, on the inside. Note that your car may not have this clip; mine did not. 3. Open the rear window section. Starting at one corner, adjacent to the "fold", unhook the bottom edge of the roof from the frame, left to right. Make note of the metal clips at each end of the rubber seal at the bottom of the roof section, and use your palm to hold the seal in place while you manoeuvre the roof away from the frame. Lift the rear section over the roof roof to give easier access to the interior. 4. Remove the three T20 Torx screws from interior dome light/roof motor trim, two on the passenger's side of the dome light, one on the driver's side. Remove the four T27 screws lower down the same trim panel. Close the window section. Remove the spoiler from the roof, detaching the brake light and removing the foam seal around the connector. Flip up the rear ("tail") of the upper roof section. 5. Remove the one T20 screw next to each roof cable. 6. Open the roof all the way, dropping the rear. Using the flat screwdriver if necessary, pull out the cables from tracks on each side; they are held in with a small amount of mastic. Using the flat-bladed screwdriver, lift up the rubber cassette seal from rear to front and slide it out towards the front. Repeat on the other side. Set the parts aside, making note of their orientation. 7. Make note of the orientation of the tracks under the seals, as well as the angles of the four little T9 screws. With the roof open, remove the small screw at each corner. Carefully raise the roof and close it about three-quarters. Remove the small screw at the front of each track, then open roof all the way down without locking it in place again and slide the bottom rails out towards the front. 8. Unhook the forward corners of rear roof section from the frame. 9. Raise the rear section and lock it in place again. Close the roof all the way then back it off a few inches. Flip up window section and unseat the strip inside, above the interior dome light trim from one side to the other; if you have a roof liner, this will come out at the rear instead of a strip. Flip down the window section and do the same on the outside. Remove the rear section. All in all, it should take about 10 or 15 minutes the first (and hopefully only) time. Now comes the fun part! Re-installing a rear roof section with a plastic window is fairly straightforward, but with a glass screen there instead you'll have to do things with a bit more care and forethought. 1. If installing a roof section with a Cabriotec glass window, make sure the top zipper is closed. 2. Carefully position the roof section against the frame and centre it. A helper would be useful to hold the section in place while you wedge the upper strip into the channel. 3. Raise the rear hatch, then hook the forward upper corners to the frame. 4. Unzip the glass window (if using) and carefully drop the rear section all the way. Make sure the flaps of the fabric over the cassette tracks are in the slots then line up and slide the metal roof rails in from the front and replace the two T9 screws at the rear. Raise the roof again and close it three-quarters forward to insert the two screws at the front. Remember to zip or velcro the glass window if necessary. 5. Re-install rubber cassette seals from the front. The old mastic may make them stick before reaching the end of travel; just use your fingers to lift the edge closest to you as you keep tugging the seal rearward. Press the front of the seal against the roof corner; it will be fairly obvious how it is supposed to look. Press down along the length of the seal. With any luck the old mastic will hold very well, but no worries if it is only so-so. Re-attach the cable ends to the rails and replace the T20 screws. 6. Flip down the rear of the upper roof section and re-install the three short T20 screws from the inside. They are very fiddly -- a magnetic bit would help here. Be careful not to lose them inside the motor housing or behind the trim panel! 7. Replace the foam seal around the brake light connector, then offer up the spoiler and attach the brake light, and position the spoiler. Look through the vent holes to help locate the screws then replace the T27 interior spoiler screws. 8. Unzip the window if necessary, then open the window section. Carefully hook the lower portion of the canvas to the frame starting from one end to the other, being mindful of the metal clips at each corner of the rubber seal. Close the window section. If you have trouble locking the window section down, back off the T27 spoiler screws a few turns and work the canvas down a bit. 9. Re-install the centre clip in lower frame if your roof is so equipped. I started out intending to take loads of pics, but as my hands got dirtier and I got more "into it" I stopped. The light in the garage was terrible (and it was too cold outside) so I gave up. The video shows quite a few close-ups, though. Thanks Francesco, looks like a possible upgrade for me in the future ( maybe next year), good to know it isn't that difficult to do myself. I am curious if there is the option to get a rear window defroster, and if so did you get it ( I seem to recall you asking questions about the switch Ed, so just curious, seems like it could be a good option to have. In any case it looks great and is definately going to be clear for the long run, good stuff. Nice job! The photo shows a defroster, but how is it connected? Those puppies have a big draw! Nice job! Added this to the USEFUL TOPICS wiki. Good write up! I'll need to redo mine soon. I saw the German video too but its nice to have something written. CsC member Uisge and I both ordered the screens with the heater elements, but as yet I haven't finalized how it will be hooked up. Nobody has been able to confirm the existence of the correct wires from the SAM to the triangle nor to the rear of the car. I will likely take a look when the weather warms up next week (it's hovering around zero today). Also, the four-button triangle is only $391 from the dealership, so wiring it up OE-style will have to wait until I can figure out how to get a four-button triangle more cheaply. Yes I can see where that would be a problem, hopefully you can find one in a scrapped car soon, as for the wiring hopefully it is all there, can't reall see them using a different wiring harness for that part ( doesn't mean they didn't, but I would think the cost of having two harness stocked would erase most if not all of the savings from eliminating the wires., now the ones to the rear of the car are another matter, hope you get it figured out even if it means sourcing the wiring as well. I'll be off all next week, mostly de-cluttering the garage so I can park indoors for the winter. After more time spent than I'm ready to admit I think I've figured out how to wire up the rear defroster. It is not as simple as "plug-and-play" unfortunately. The '05+ cabrios are not pre-wired for it. If it warms up a bit in the next few days I'll have the SAM out and opened to verify that relay K1 is indeed in there. In the cabrio with electric mirrors, the mirrors' heat is switched live with the ignition, instead of with the rear defroster relay as in the coupe.The cabrio's switch group ("triangle" or "island"), along with not having the switch or LEDs for the rear defroster, has no signal wire for relay K1 (SAM connector 9 position 32); the triangle's AMP connector position 7, which would be for that wire, is naked. And finally, there is no fat power wire from SAM connector 2 to the defroster, nor a fat ground from the window to anywhere. Hope you get the defroster figured out, when/if I ever replace the rear window I would want to replace it with the glass with defroster so it would be nice to have someone to have written up how to do it ;)So good luck. Francesco, I finally installed mine! The weather was an unseasonably warm 18°C today, and so I took the opportunity to install mine. Though it was sunny when I started, the rain clouds were threatening, and it was pouring when I finished. I had planned to take many pictures, but the time window made that impractical.With my schedule and the weather since my return from Germany, I thought I wouldn't get it installed this year. Now that it's in at least I'll be able to scrape the ice off! I may look at doing a temporary electrical hookup directly from the battery, and controlled with an ignition signal, for this winter, and look into something more permanent next year.Though I have measured neither the resistance nor the amperage, Chris guessed that it would draw 8 amps. I'll let you know if I am able to measure it. You replaced your back clear plastic to put a back glass?? How is it possible? How is it fold when you open the complet roof? The upper part of the window has to be unzipped before the top is dropped! It is a brilliant work-around. Yes, it takes some getting-used-to when opening the trunk, and having to remember to un-zip it. I'm waiting to find either a four-button safety triangle, or an unused one- or two-button one. But I may just do a temporary connection, too. 30 Amp fuse and 10 gauge wire. I measured the resistance of the defrost traces, and they came in at about 1.4Ω. That puts the draw (assuming 14 Volts) at 10 amps. I need to do a temporary connection to see if the resistance changes with temperature.As an added bonus, the car is noticeably quieter on the road (engine and tire noise). It IS more quiet! :)The SAM fuse #28 is used for both the rear defroster and the "engine fan" (no idea if that's the radiator fan or the IC fan), and rated at 30 A. I imagine a 15 A fuse would be OK for a separate circuit. The only problem with a "simple" hook-up is the lack of a timer, so we'd have to remember to switch it off after a few minutes. Francesco: Please do tell—where can I see the video you mentioned? Desperately, obviously need guidance in undertaking this scary but necessary fix. I'm in Los Angeles—no dealers here, and my mechanic—the only one in the region—tends to need me to feed him information beyond the basics. Nigel—Oh, bless you my child—you've saved the day. Thank you so much!! The glass conversion was done by Cabriotec.de in Germany but I don’t think they are around anymore. I don’t think Francesco is around here much if at all anymore either. My understanding was that you unzipped the glass on 3 sides and it hinged on the bottom. Look at the last ten seconds of this video https://m.youtube.com/watch?v=MVgoxhu7tm4 and I think you will get the idea.